I hate these, "If you are serious and are familiar with the builder please make a reasonable offer and leave a name with phone number." Yeah, well, if YOU were familiar with the builder then you'd KNOW what it's worth and list a reasonable price instead of fishing. That particular seller has been flagged numerous times. Reports of extreme perversion, crude replies, etc. to potential buyers. The bike has been posted for at least 6 months. but this is 531, at least the main tubes, so a 6** or 7** at least? but mostly 2) I’ve got all trek tourer I can handle right now! But I DO want to ID it! 710 frameset built up, all 531. Avocet triple crank (by Ofmega). Bikes: 1972 Falcon San Remo, 1974 Maserati MT-1, 1974 Raleigh International, 1984 Lotus Odyssey, 1990 LeMond Le Vanquer (sic), 1991 Specialized Allez Transition Pro. 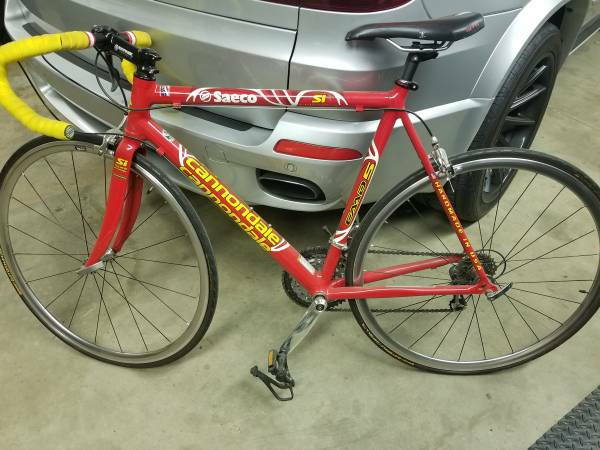 27" Classic Racing bike for a tall person. 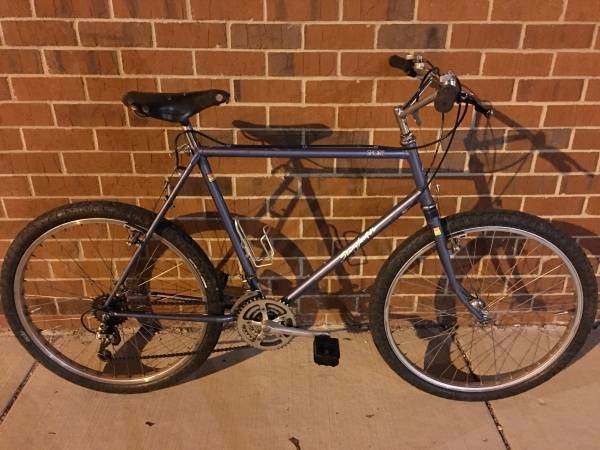 12 speed In great condition. From and rear quick release wheels, bottle holder, Chromoly frame Bontrager Select K tires, foot straps with reflectors. Please see pictures." Couple of nice looking super courses. The Japanese one is especially nice. Both 59cm, both RED. "Here is a nice Childs Sidewalk Bicycle from the 1920's. Solid hard rubber tires. Made by Murray, Ohio. Older restoration, painted red, handlebars and pedal cranks painted silver. Nice saddle with springs." Not exactly vintage but I just ordered these Dia-Compe 1245 stradle wire hangers from a guy in Japan. He has lots of Dia-Compe and MKS stuff for cheaper prices than I've been able to find in Europe or the US. Purchased a couple of Nitto Crystal Fellow stems from that seller, good prices. "Lugged steel. Made by Bridgestone when Grant Peterson of Rivendell fame was designing the bikes. This would be an XL frame, about 59 or 60 cm top tube and about a 61cm seat tube from center of BB to center of TT. From center of BB to top of seat tube is about 63cm. 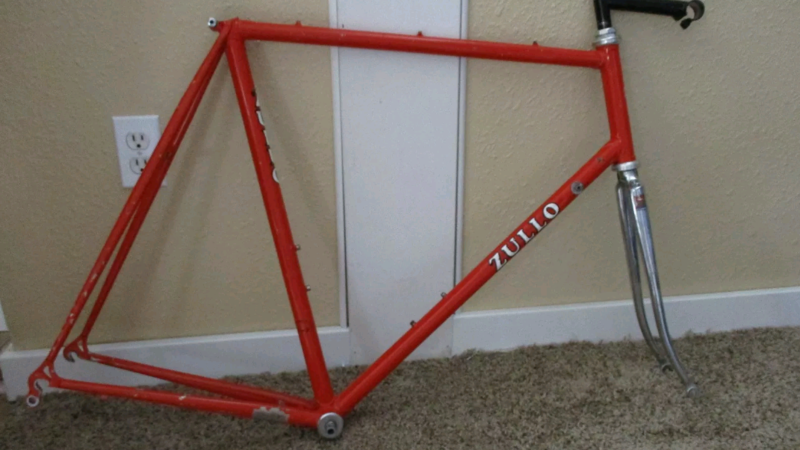 Steel frame with lugs. This would make a great touring bike or commuter. It will need a tune up." This bike has been stored in a climate controlled room for at least 18 years. I do not believe it was ridden much, if any, prior to that. All parts are original, including Bar tape and brake pads. It shifts properly in a bike stand, i would recommend a tune up and new tires after purchase. There are a few storage scuff marks but other than that it is in immaculate condition for being 31 years old. 3 Peugeots in varying condition from 150€-40€. Rhone-Alpes, east of Lyon. 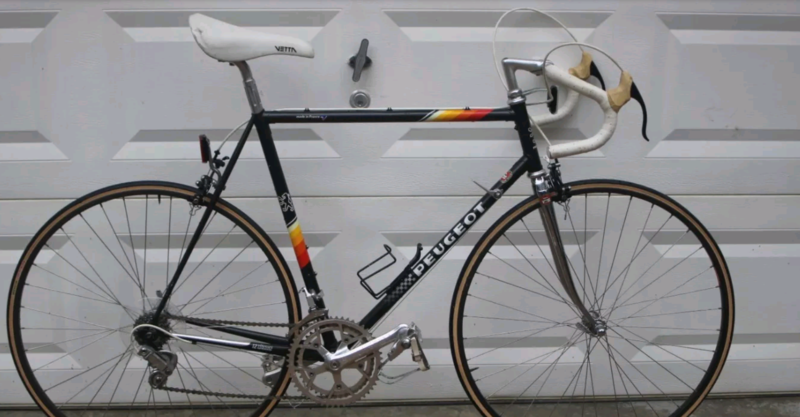 Peugeot 4000 Competition, 3 main tubes Columbus Thron, Campy Mirage 8 speed triple. Peugeot Pf 1000. Reynolds 708, Mavic/Sachs ergopower group. Been sitting for a while at this price. Just out in the 'burbs of Caen in Normandy. Cannondale Caad5. Excellent condition. Rarely used. Needs a good home. Text 262 993 double 6 double 1. Throwing in the towel on this retro GT Tequesta project. Selling my Triple triangle GT steel frame and fork in the highly sought after "Team Scream" colorway. Size is 16.5" (measured center of bb to top of seat tube) with an effective top tube of ~ 21.5"/52cm, roughly translates to a size small. Will also include the headset, bottom bracket, original GT stem/bars and some yellow Oury grips. A project I started that never came to fruition. A great start for a winter mtb project or gravel bike - Please message me with any questions. Thanks! Another Super course. The cranks are definitely not original, but it looks like the rear mech is a suntour cyclone? The pictures make it difficult to get a true estimate of its condition. Also, I know the fork rake on these change throughout the years, but I think it'd be worth checking out other pictures of the same mode/year to make sure the fork on this one is okay. The seller says 58cm but to me it looks larger? $100. Do these really pull in that much coin? If so, I have two of these I should put on the market. "...otherwise complete."?? No. 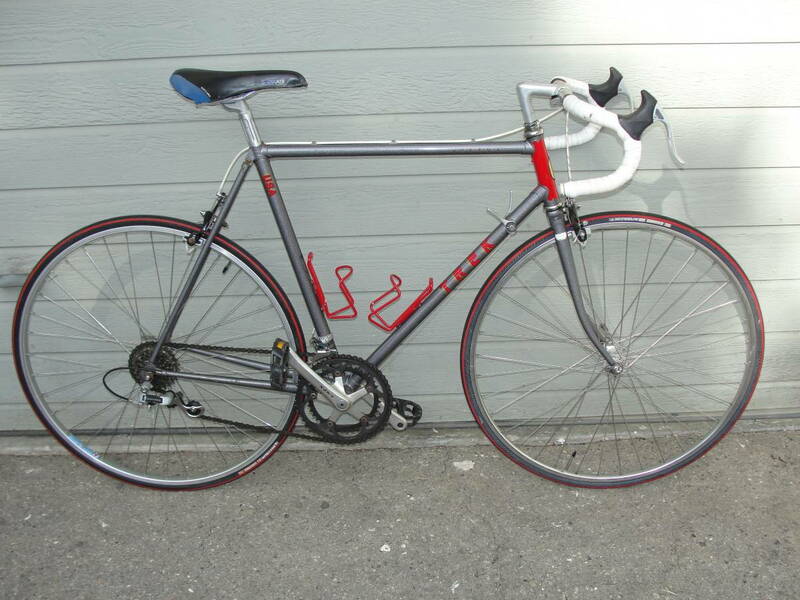 It is missing front and rear derailleurs, inner chain ring, 6speed freewheel, cowhorns, shifters etc. And it needs a 24" front wheel. BUT it is a very cool bike. It needs a front wheel, otherwise complete.